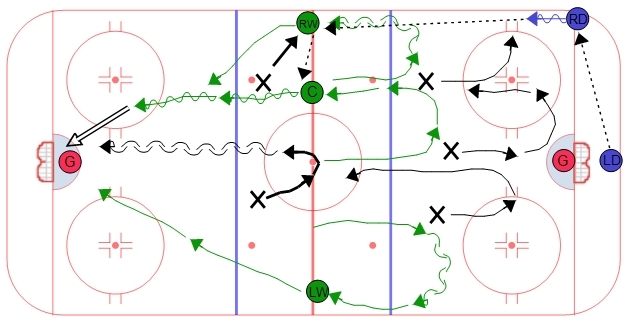 This breakout can be effective against an opponents agressive forecheck or a trap forecheck such as a 1-2-2. The key is that you will need defense that are reliable and have the ability to pass the puck hard. The breakout is most effective when the defense has a chance to go retreive the puck off of a dump in and are not immediately pressured. The strong side defense will retreive the puck and use the net as some protection while the other defense goes to the corner for an outlet pass. The first pass is made to the defense in the corner. At the same time, the strong side wing will stretch along the wall and needs to face the defense so that they can be ready for the hard stretch pass at any moment. This wing needs to at least be on the offensive side of the red line so if they need to chip the puck into the offensive zone it will not be called an icing. The defense needs to make a hard pass to this wing, the harder the pass the more options the wing will have to make a play. The wing has three options. The can defelct the puck deep into the offensive zone, pass the puck to the center who is coming through the middle of the ice, or chip the puck off the wall to the center. At the same time, the weak side wing will be timing their zone entry with the center. If executed correctly it can easily result in a 2 on 1 situation if the the opponents strong side defense gets sucked to the outside to the strong side wing.